Coral Reef Ecology (CRE) course exposes the student to the reef ecosystem at all organizational levels from physiological ecology through population biology and community structure to ecosystem dynamics and ends with consideration of human impacts. The format and content of the course is geared to upper level undergraduates and graduate students, teachers and professionals. CRE is an intensive, integrated program comprised of lectures, required reading, laboratory exercises and field surveys. The lectures cover a broad range of relevant topics and ecological principals in coral reef ecology that are supplemented by readings from the primary literature with attention given to active areas of research. The course is divided into 20 lectures (1 to 1.25 hours long), 9 field trips (4 hours each), 6 lab sessions (4-5 hours each), 6 precepts (1 hour each), 3 seminars by BIOS scientists on current research, a take home written exam, and an afternoon of oral presentations. An additional 10-15 hours is taken to complete the working-group analyses and presentations. Each student is graded on participation (50%), exam (25%) and oral presentation (25%). All participants in the course must be certified SCUBA divers with current certification, including the medical examination. The lab work is focused on training in practical techniques commonly used in coral reef research: cell fractionation by centrifugation, enumeration of zooxanthellae with a haemocytometer, chlorophyll analysis, determination of coral surface area, and measurement of coral growth. Various field techniques and subsequent lab analyses are used repetitively at different sites so that each student has the opportunity to become familiar with the following methods: video-taping reef transects to assess community structure, quantification of reef fish community structure using a visual census method, quantification of parrot fish feeding rates and social interactions, quadrat sampling of reef algae, sorting, identification and dry weight biomass estimation, quadrat sampling and measurement of juvenile corals and gorgonians to construct size/frequency curves. The most significant aspect of the course is a final synthesis of the data sets collected from the different study reefs and laboratory experiments. The students divide up into small groups to collate and analyze data sets for a particular parameter (e.g. algal biomass and diversity or coral community structure). They look for trends and patterns across reefs and correlations with other data sets collected during the course. The groups then present their analyses as final oral presentations (also requiring a 300 word abstract and a list of 4-5 references) and discuss their conclusions with the rest of the class. The presentations are based on a typical format for presenting scientific results to an audience and so are designed to provide experience in communicating science. This 3 week intensive course is taught at a beginning graduate or advanced undergraduate level. This course is broken into two major components: a field/ laboratory component and a genomic/ bioinformatics analysis component. The first two weeks of the course cover microbial ecology and oceanographic topics such as physiology, microbial diversity and growth within the context of biogeochemistry with particular emphasis on the oligotrophic mid-ocean environment in the vicinity of Bermuda. 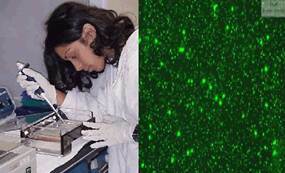 During this phase several molecular and microbiological techniques are introduced and experimented with in the laboratory including fluorescent in situ hybridization, terminal restriction length polymorphism and ordination analyses. In the last week of the course the students are introduced to genomic tools and the computational approaches useful in the analysis of high-throughput sequencing data to address specific hypothesis relevant to marine microbial ecology. 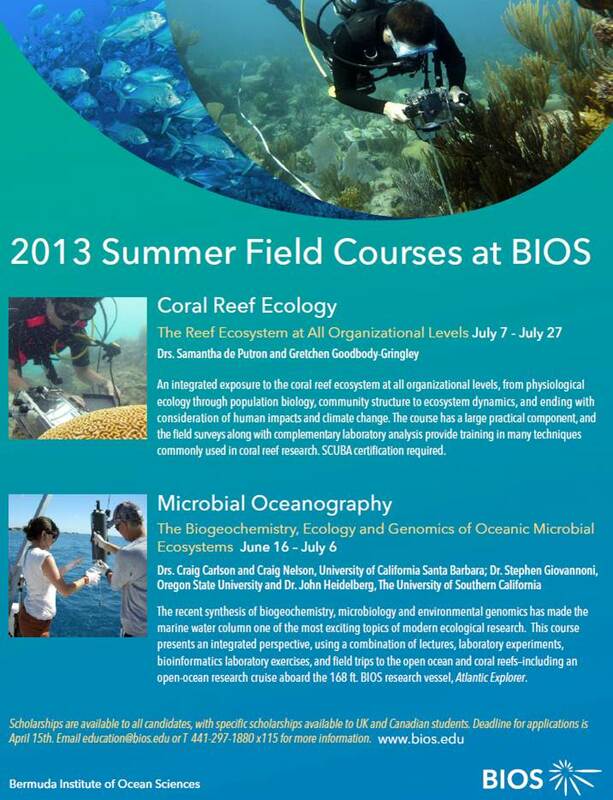 Microbial Oceanography at BIOS is presented as a balanced lecture-lab-field and computer-lab course. The number of laboratory hours is approximately equal to the number of lecture hours, and students participate in a variety of field experiences from molecular assays to an oceanographic research cruise. In addition, several meetings are devoted to topical issues current in the literature. The lectures focus on how biological processes and the ecological structure within the water column control the cycling of important elements in the ocean such as carbon, nitrogen and phosphorus. For the genomic/bioinformatics component of the course the students utilize a variety of computational tools from genomic assays of the Sargasso Sea Metagenome data to web accessible databases like the “Comprehensive Microbial Resource”. The students are given metagenomic sequence data from two 454- pyrosequencing runs generated for this class. They gain experience with online bioinformatics tools used to analyze the data. In addition, several meetings are devoted to topical issues current in the literature. The lectures focus on how genomic data could be used to explore environmental microbes or test a specific hypothesis. Group research projects designed, conducted, and presented by the students provide a hands-on demonstration of the ideas and techniques that were taught during the class. These projects are carried out using field and laboratory resources available to the course, as well as the BIOS library resources, and are presented to the entire group at the end of the course. The first two weeks comprise a total of 10 lectures (1- 1.5 hrs each) were presented. These lectures are supplemented with six methodological lab exercises (3- 5 hr each) and a field trip, aboard the R.V. Stommel and Atlantic Explorer. Lecture and lab topics include: Traditional microbiological methods, bacterial and virus enumeration, Polymerase chain reaction, Fluorescent in situ hybridization, Terminal Restriction Fragment Length Polymorphism, and ordination analysis. For the final week a total of 15 genomic focused lectures (1 hrs each) are presented. These lectures are supplemented with 2 methodological computer lab exercises (3- 5 hr each). Lecture and lab topics include: Introduction to traditional genomic methods, Introduction to metagenomics, sequencing and closure methodology, Genome annotation, Bacterial Phylogeny, Web-based genomic tools. The student’s grade is based on their performance in the lectures, laboratory, and a class presentation. A flyer is attached to this email. Thank you for potentially helping us to spread awareness of our available opportunities, we hope to be able to welcome University of Washington students to BIOS in 2013! If you have any questions about any of BIOS’s programs please e-mail education.